This book examines various theoretical and practical issues in translation in imaginative and instructive ways. It provides translation students and translation teachers with a good understanding of the real core of what translation is all about, despite the fact that a lot has been written on translation. Such writings created more confusion about this important profession. This book addresses thorny issues that are often regarded as impossible such as the translation of poetry, cultural issues, etc. Above all, this book not only explains intriguing aspects, but also presents real and live examples from everyday writings. 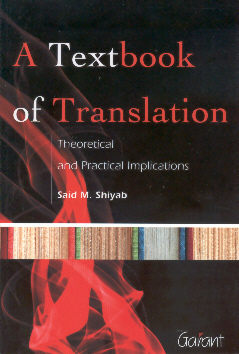 Said Shiyab is a Professor of Linguistics &Translation and the Chair of the Translation Studies Department at the United Arab Emirates University, UAE. Prior to this, he was teaching in the English Department at the University of Southern Indiana (USA) where he taught different courses of English. Dr. Shiyab is a member of BABEI's Editorial Board and Chair ofTesting and Accreditation Committee for the World Arab Translators Association (Belgium). Dr. Shiyab has published over 40 scholarly articles in welf-refereed journals and contributed articles to Volume 7 and 17 of Benjamin Translation Library. His research interests involve systemic linguistics, theories of applied linguistics, and translation studies. He is currently working on another book entitled Literary Genre in Translation.